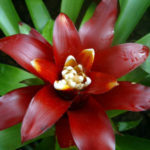 Bromeliads are similar to a beautiful woman—stunning in a red dress, perfectly formed, graceful to behold… then gone. The bromeliad is stunning while in bloom, but with the exception of few types, bloom once and then it’s over. 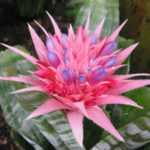 Bromeliads in the wild are hardy and adaptable to a variety of climates from rainforests to deserts. Pineapples are bromeliads as are Spanish moss and air plants. To successfully cultivate, grow and bloom these stunning plants year after year requires a certain human-plant relationship and knowledge about the species. However, enjoying bromeliads is easy with a Plantique plant rental program because replacement after the bloom is guaranteed. 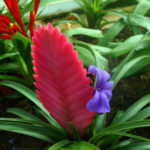 Scarlet Star (Guzmania lingulata) is one of the most popular. The Scarlet Star’s forest green foliage, bright red bracts and small white flowers is a spectacular centerpiece in any space. It’s the only plant that when its “urn” (the natural cavity in the middle of the plant) is filled with water all the time it will not rot. Blushing Bromeliad (Neoregelia carolinae) show off a vivid pinkish red “blush” at its center point in season while shiny green foliage keep the interest going all year with white stripes along the edges of each leaf. Some varieties show off lavender, violet and white flowers, but once they bloom, re-flowering is unlikely. Pink Quill Bromeliads (Tillandsia cyanea) are show stoppers with their spiky green leaves and stemless “rosettes” that are actually curvy, paddle-shaped spikes or bracts. Small purple flowers pair with pink bracts to produce an exotic, tropical look. The Pink Quill blooms disappear after about 3 months, making this plant a sensible choice for Plantique’s rental program. Primera Bromeliads (Aechmea Fasciata) have wide, greenish silver variegated leaves with back curling spines and long-lasting flowering bracts in all hues of pink with smaller purple flowers following. They are easy to grow and fun to propagate. The little “plantlets” produced by the Primera can be cut off and replanted in small pots singularly or in clusters. The bromeliad family is wide and varied. From needle-thin to broad and flat leaves, symmetrical to irregular, spiky to soft, vivid to subtle, the choices are plentiful. 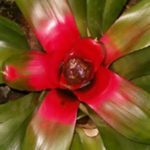 Interested in adding bromeliads to your plantscape? Call us to arrange an onsite visit to assess your humidity, light and soil conditions. If you have questions about bromeliads, please call us at (561) 641-0124.